The Pacific Division was arguably the most competitive in the entire NHL last season from top to bottom, but that's of little consolation to the Anaheim Ducks. The top three teams -- Phoenix, San Jose and Los Angeles -- were separated by two points, with the Kings going on to best the Coyotes in the Western Conference Finals and then win the franchise's first Stanley Cup. Dallas finished fourth, out of the playoff mix, but stayed in the race until the final week of the regular season. The Ducks? They endured a terrible first half of the season, replaced Randy Carlyle as coach with Bruce Boudreau, then went on a furious run to cut a 20-point deficit in the postseason race all the way down to four before fading late and finishing with a 34-36-12 record, last in the Pacific and 15 points shy of a playoff berth. Anaheim hasn't made any splashy moves to this point in the offseason and, shy of the Bobby Ryan trade rumors coming to fruition, probably won't. Instead, the Ducks will hope the revitalized health of goalie Jonas Hiller, a return by the ageless Teemu Selanne, and more consistent production from Ryan and linemates Corey Perry and Ryan Getzlaf help spell a bounce-back 2012-13 campaign. "It's the first time I've ever been up against something like that," Getzlaf said in the Orange County Register about both the Ducks' struggles and his own. "I've never been part of a team that struggled the way we did at the start of the season. I learned a lot from it and hopefully how not to duplicate it." For a team that scored 204 goals -- seventh-worst in the NHL and 35 fewer than the previous season -- the importance of Selanne's return can't be understated. As the Ducks try to develop some of their young talent into secondary scorers who can ease the pressure the top line has to produce, the 42-year-old Finnish legend remains a cornerstone of the offense -- especially on the power play, where his 12 goals last season ranked eighth in the League. "I still feel that I have something to give and that I can still play on this high level," Selanne said during a conference call to announce his return. "Even with the tough first half we had last year, I still enjoyed the game so much." Selanne is just one of many Ducks to speak glowingly this offseason about the job Boudreau did to turn the club around after his hiring last Dec. 1. The coach to reach 200 wins the fastest in the modern era, Boudreau posted a 27-23-8 record after taking over. Anaheim rewarded him in May with a two-year contract extension through the 2014-15 season. 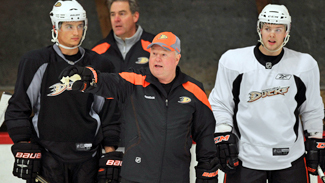 The hope is with a big chunk of last season plus a full training camp under his belt, Boudreau's system will have become second nature by the time the first puck drops on the Ducks' regular season, Oct. 12 against San Jose. As coach of the Washington Capitals for parts of five seasons, Boudreau was popular among his players but also knew how to lay down the law and get their attention when he felt it was necessary. "He does it in a right way," Ryan said in the L.A. Times late last season, after Boudreau had to give the team a dressing down. "He does in a way that makes you want to give a little more, makes you want to work that extra bit." There were some alterations made to the Ducks' roster over the summer. They elected not to re-sign third-line forward Niklas Hagman. Physical fourth-liner George Parros and defenseman Sheldon Brookbank left via free agency, and the team also dealt blueliner Lubomir Visnovsky to the New York Islanders. 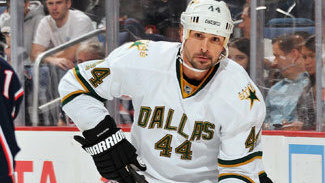 New additions brought in by general manager Bob Murray include a pair of veteran defenseman -- Sheldon Souray, who had a resurgent season with the Stars and brings a booming shot from the point, and Bryan Allen, a steady stay-at-home type -- as well as checking forward Daniel Winnik and gritty Brad Staubitz. Swedish goalie Viktor Fasth was signed as the new backup to Hiller. "We lost a couple good guys but we got what we were looking for. I'm excited for those moves and I know [Souray and Allen] are going to be a big part of our defense," Selanne said. "And the rest of our core is so strong. … I truly believe we have all the pieces. That's what makes this very interesting and special because I think we all feel there's unfinished business." And while players like Selanne and 37-year-old fellow alternate captain Saku Koivu represent the elder statesmen on the Ducks, the roster is full of young talent who must continue to develop, like defensemen Cam Fowler and Luca Sbisa and forwards Nick Bonino and Devante Smith-Pelly. In addition, a list of prospects headed by forwards Kyle Palmieri and Emerson Etem are knocking on the door. In many ways, Anaheim's 2011-12 campaign mirrored that of the New Jersey Devils a season earlier. The Devils bounced back and went to the Stanley Cup Final last spring; while it might seem a tall order for the Ducks to do the same, their goal of making the playoffs is realistic. And as the Kings just got done proving, once a team gets there anything is possible.